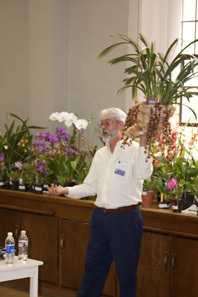 Once a year in late spring, OSSC hosts an auction of high-quality orchids. This is the main fund-raising event for the society, and proceeds from this event are vital to the continued operation of OSSC, Southern California's oldest orchid society. This year, hundreds of beautiful orchids will be available for sale at OSSC's Annual Orchid Auction. The auction will be held on Saturday, June 22, 2019 starting at 1:00PM at our usual meeting site in the meeting hall of the First Christian Church, 221 South Sixth Street, Burbank, California. Doors will open at 12:00PM for plant inspection and bidder registration; plant donations will be accepted after 11:30AM. The bidding should be over by 4:00PM. A wide range of orchids will be available, with well-grown varieties of species and hybrids suitable for everyone from the orchid novice through the advanced collector. Door prizes and refreshments will be offered, and admission is free to all. Payment may be made by cash, personal check, or major credit card. Feel free to bring your friends and neighbors! 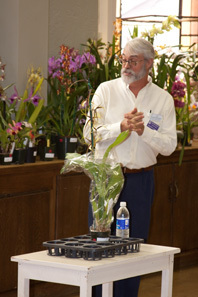 We are again privileged to have a fully accredited American Orchid Society Judge, Doug Overstreet, to conduct the auction. 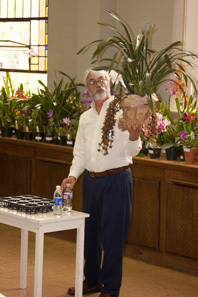 His encyclopedic knowledge of orchids and lively banter always make for a great orchid auction experience. There are two posters available to download and post (with permission) to advertise this year's auction, one in full color and the other black and white . You will need the free Adobe Acrobat Reader installed on your computer to read and print these. You are encouraged to print a few copies and post them at your places of work and commerce. Thanks for helping the society get the word out! So come for the fun, come for the food, and come for the orchids....it's going to be a great afternoon!